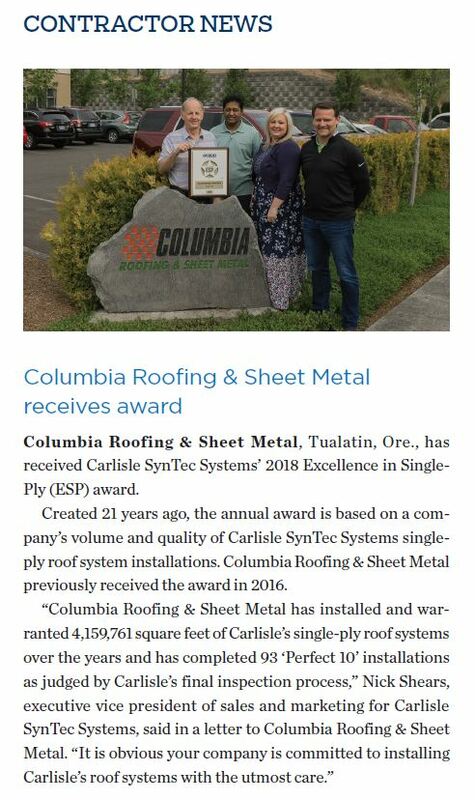 TUALATIN, Ore. — Columbia Roofing & Sheet Metal, a leading specialty roofing contractor in the Pacific Northwest and Southern California, has been honored with the Carlisle SynTec Systems’ 2018 Excellence in Singly-Ply (ESP) award. This is second year Columbia Roofing & Sheet Metal has earned this award; the first award was in 2016. ESP status is an annual award — created 21 years ago by Carlisle — to congratulate a small percentage of its most dedicated and professionally minded applicators. According to a’ letter from Nick Shears, executive vice president of sales and marketing, Carlisle SynTec Systems, selection into this elite group is based on a company’s volume and quality of Carlisle single-ply roofing systems. 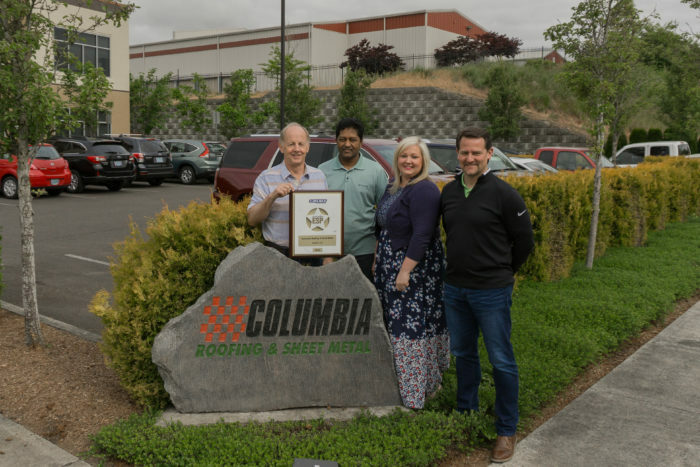 Columbia Roofing & Sheet Metal CEO Mark Carpenter said his company takes pride in awards like the ESP because it sets his company apart from the competition — as the only Oregon contractor and one of the two percent nationally to earn the honor this year. “Industry honors like the ESP award illustrate the quality people who contribute to the success of Columbia Roofing & Sheet Metal,” Carpenter said. “It shows not only our dedication to quality, but our position as an industry leader. Our core values are: integrity, relationships, respect, results and safety. These core values produce the best results every day. We live these values each and every day and the ESP award shows how other industry professionals also recognize Columbia and the people who work here as the ‘best of the best.’ I am privileged to work with such great people.